This blog post is a brief introduction to the role of music in my life, so that future posts can take up specific themes in more detail. An earlier post on this blog contained some photographs of musical scenes from my childhood. My mother plays piano and sometimes the flute, and during the last few years has taken up teaching music to primary school students at a local school. Her father used to be the conductor of the Maitland town band. My father’s side of the family is less musical, but his mother played a bit. I’m told that when I was very young, certain music had me entranced. As a small child, whenever the Doctor Who theme music played I would apparently drop everything, run to the TV and stand there until the music stopped (this was years before I became interested in the program). I’m also told that a favourite toy of mine was a tortoise that played “I’d like to teach the world to sing“. A cassette made when I was three years old — to send to grandparents when we were living overseas — contained my first recorded composition. It went like this: “The curtains, the curtains, the curtains, the curtains, the curtains, the curtains, the curtains, the curtains. And now I’m going to sing about the frog. The frog, the frog, the frog, the frog, the frog, the frog, the frog, the frog“. The cassette is now lost, but this could have been a hit, don’t you think? I started piano lessons when I was six, for which I was taken out of school each week and had a custard and pudding lunch at Grandnan and Papa’s place afterwards. I quickly developed an interest in composing music. Mrs Gregory, my teacher, limited the creative part of the lessons to the first five minutes, but I was never passionate about reading music from paper and after a few years I lost interest in the lessons and stopped. I’ve had other piano teachers. Among these was Melinda, who offered a more tailor-made curriculum in which I could learn what I was interested in. Once she introduced me to the musical modes, and set me the exercise of composing a tune that exploited them. I’ll share the fruits of this exercise in a future blog post. But she left the town when she got married, so I didn’t have her for very long. The instrument I played in the school band was trombone. I enjoyed this at the time, but didn’t continue playing afterwards. We did a tour or two around nearby schools and went busking in Adelaide once, playing Christmas carols, and one year I and one classmate played for the town musical. At Grandma and Grandpa’s place was kept an electronic Yamaha keyboard that we’d bought, and was available for us grandkids to play when we visited. I inherited it after Grandpa died, and used it to compose various songs. But the instrument died in 2000 from battery leakage. 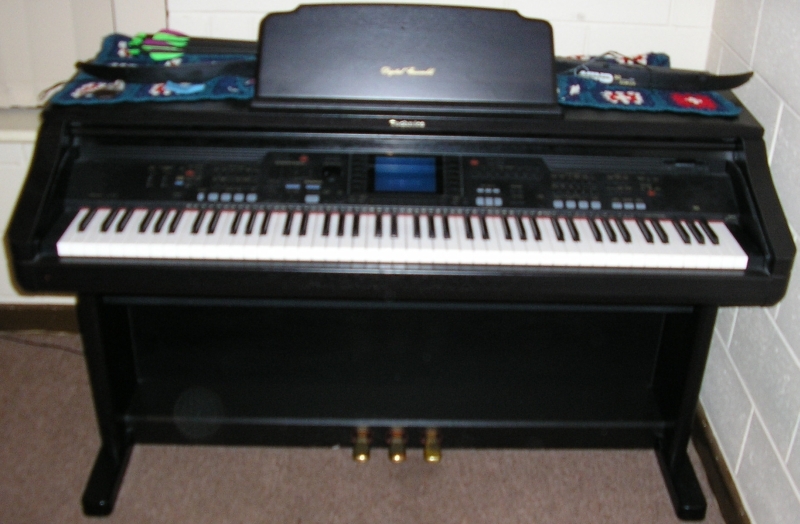 Later I was given a much more sophisticated Technics electronic piano, which I still have, and use mostly for improvisation rather than true composition. Here’s a photograph.